Email is 40 times more effective at acquiring new customers than Facebook or Twitter. That helps explain why 89% of marketers use email as their primary channel for lead generation (Mailigen). The one-to-one nature of email communication enables you to deliver more personalized messages targeted to subscribers’ needs and preferences. This builds a personal connection, increases trust and engagement with what you have to offer. Growing an email list is therefore an essential task to building a successful online business. But to succeed, you need to build the right kind of list. You want access to subscribers who are keen to hear from you and be ready to take action on your advice. How to do that is the focus of this article. You’ll learn simple yet powerful techniques for building a list of loyal email subscribers. Offer a valuable free gift in return for their email address. Your free incentive should help solve a common problem for your target audience, such as a tool or template. Drawing upon your unique insight, you can easily create a lucrative incentive that cannot be found elsewhere. Whilst you can repurpose your existing content on your chosen topic area, be sure to add extra value by recombining the information in new ways, adding additional insights or providing actionable takeaways. Don’t give away everything all at once. That’s why autoresponders are so effective as opt in incentives: you can send short bursts of digestible content and drip this over time. Build anticipation for your next email by reminding them what’s coming up in future emails. If you provide a free e-book, be sure to remind them why they should stay tuned to your updates. Ensure your free gift supports the spirit and content of your emails. You don’t want to disillusion people by sending them content that isn’t related to what they signed up for. The free gift should provide a taster of what to expect. Make subscribers feel special with exclusive content. Produce content exclusively for email subscribers and deliver this through password protected pages that only they can access. Offer materials that add extra value to your open access content, such as checklists and worksheets. Create opt-ins to serve different user needs. You could create opt ins for different topic areas on your blog, or even create dedicated opt ins to support your best performing blog posts. Letting email subscribers opt in to the areas that interest them most will translate into higher open and click through rates and lower number of unsubscribes. Consider where the user is in the customer journey. If someone has just opted into your list, they are likely to be at the beginning of their journey with you, so take time to nurture them before diving into a sales pitch. Be sure to remind them of the benefits of being an email subscriber inside your free download, but don’t sell your product at this stage. Whilst you could weave product mentions naturally into your content, this is more likely to occur at a later stage of the customer journey. Effective presentation of your opt-in offer is essential. If you don’t properly communicate the benefits of being a subscriber, no one will subscribe. So, let’s consider how you can perfect your copy to maximize sign ups. Succinctly tell readers how they will benefit by signing up. You need to clearly set out the benefits by telling them what they will learn and/or receive. Remind them of the transformation they will get from engaging with material from the free incentive. For example, if you are offering a free quick-start guide to better landscape photography, reassure them how learning this new skill will enable them to recapture their travel journeys more effectively and provide a valuable memory bank of their experiences in years to come. Remember, be very specific and honest about how they will actually benefit. Support your subscription offer with a wealth of other evidence. This might include: your credentials/qualifications/experience (setting yourself apart as an expert in the subject area); examples of your previous emails (direct evidence of the value they should expect to receive); testimonials (showing how others have benefited); statistics (supporting why they need to engage with the topic you teach or the effectiveness of the methods that you use). Create clear call-to-actions that focus on the readers (not your own) needs. You also need to strike the right balance. Be neither pushy nor wimpy, clever nor confusing in your requests. Do be confident and direct. So, use a confident tone to reassure your reader and provide the information they need to take action on your offer. Ensure you consistently deliver high quality, relevant content across your other marketing channels. From a reader perspective, it provides a glimpse into what they can expect from being a subscriber and reassures them that they will get value from signing up. Creating an irresistible offer is useless if no one knows about it. So, it is crucial to raise awareness of your offer amongst your target audience and get it to the channels that they know and trust. Here’s how. Give plenty of opportunity for sign-ups on your website. Include the offer on all areas of your site, including your homepage, blog, about and contact pages. Promote your free gift across your social media channels. Consider how your call-to-action could be customized to meet subtle differences in interests and preferences across different social media networks. For example, a particular message style or content type might perform consistently well with your Twitter followers, but not with your Facebook audience; so, craft your offer accordingly. 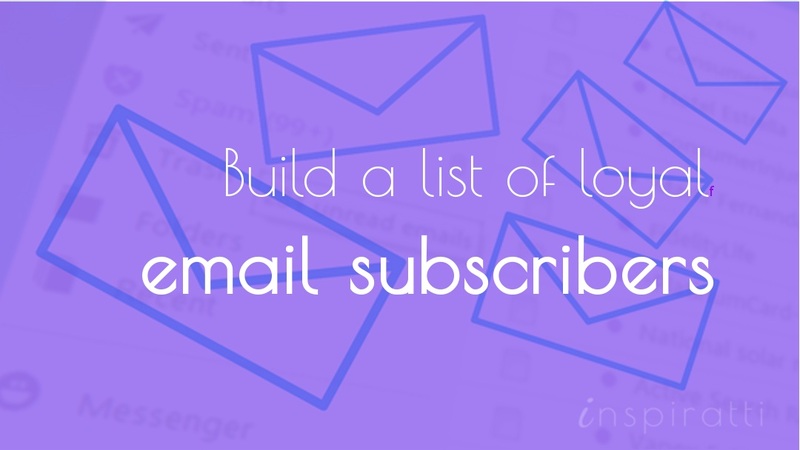 Encourage your existing list of email subscribers to share your newsletter with their network. To do this, include visible social sharing buttons and forward to a friend links in your emails. Remember to include a subscribe link within the email so that those receiving the forwarded emails can sign up. What other ways can you facilitate subscribers’ positive word of mouth? Start writing them down. Utilize cross promotion for mutual gain. Approach others in your niche, and make a mutual agreement where they feature you in their emails and you feature them in your emails. How can they refuse, after all it’s a game of mutual gain. You could even provide a special free (opt in) gift dedicated to their readers’ interests; it will offer more value to their audience and send more promising leads to you. Consider guest blogging. If you get published in an authoritative blog in your niche, this cuts out the amount of persuasion work that you need to do. Readers will already be convinced by your credentials due to your association with the host, and so will more readily sign up for your offer. Try to mention the offer within the guest post (if the site owner permits). You’ve worked hard to grow your subscriber numbers. How can you keep them subscribed? You need to maintain your readers’ engagement in your content and build their trust. How can we do this? Give them something to look forward to. Ensure every issue is unmissable by delivering high quality content that offers real value. Keep your email subscribers motivated by telling them what is coming up in future issues and how this will benefit them. Focus on relationship building. From day 1 (your first email), show that you are concerned about your subscriber and want to help them. Keep a personable and friendly tone to help build trust. Initiate a two-way conversation. Email subscribers want to feel their voice is heard, so invite their feedback, opinions, and suggestions. Ask them what they like most and least about your content, and what other areas they would like you to cover. Their ideas could be a great source of inspiration for new blog content and will help you create content that better meets their needs. Don’t make promises you can’t keep. If you say you will do something, ensure you actually can and do deliver. Why are marketers still so focused on email marketing? The answer: it works. In fact, email get 10 times higher conversions than social media campaigns. But to realize real results, you need to build an effective list. Doing so will give you access to a list of contacts who are interested in what you have to offer and have chosen to receive information from you. So, how can you build an effective list? Knowledge of effective list building techniques and a dose of creativity are very useful. But, the key ingredients are hard work and perseverance. It takes a lot of time and effort to build an effective email list. The best time to start building a list has already passed. The second best time is now. So, try out these tactics and get started on building your own list of loyal email subscribers. Have you already started building your email list? What strategies do you use to grow subscriber numbers and maximize engagement with your emails? Share your insights in the comments. Enjoyed this post? Follow me on Twitter for latest updates email and other crucial marketing areas.